Most of us have no idea what’s really going on inside our heads. Yet brain scientists have uncovered details that every business leader, parent, and teacher should know — for instance, that physical activity helps to get your brain working at its best. How do we learn? What do sleep and stress do to our brains? Why is multitasking a myth? Why is it so easy to forget — and so important to repeat new information? In Brain Rules, Dr John Medina, a molecular biologist, shares his lifelong interest in brain science, and how it can influence the way we teach our children and the way we work. 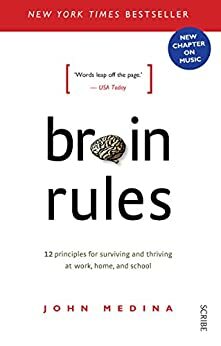 In each chapter, he describes a brain rule — what scientists know for sure about how our brains work — and offers transformative ideas for our daily lives. In this expanded edition — which includes additional information on the brain rules and a new chapter on music — you will discover how every brain is wired differently, why memories are volatile, and how stress and sleep can influence learning. By the end, you’ll understand how your brain really works — and how to get the most out of it. John Medina is a developmental molecular biologist. He teaches in the department of bioengineering at the University of Washington and is the director of the Brain Center for Applied Learning Research at Seattle Pacific University. He lives in Seattle with his wife and two sons. First few chapters were great. Middle and latter chapters were a bit tedious. All in all, I got some great insights into how the brain works! An entertainingly written book, with apparent scientific backing which has practical applications for living life and enjoying it more. Still reading this book but it has amazing insightful information that can only do good as it is shared among the population.